Time to write some reviews — look for a review of the Bits Limited SmartStrip in the next day or so, followed by more extensive reviews of the Ultimarc ArcadeVGA card and the Wells-Gardner D9200 arcade monitor in a few days. The MAMEframe Has Been Sold! I'm both happy and sad at this moment. I sold the MAMEframe to a local couple who are devoted arcade game junkies, and who are apparently in the process of transforming their basement into an arcade. I think the MAMEframe has found a good home, but I'll miss it. At last! Just what I was hoping for — SlikStik has announced new Ball-top Stainless Steel Joysticks. Very, very cool, and just what a die-hard Robotron player dreams of having on his cab. Trust me when I say that, one way or another, I will definitely get a pair for review! Airborne Express has finally gotten my tracking number into their system, and it shows my ArcadeVGA card as still being in London. No estimated delivery date on their system, but I suspect it'll be a few days before it gets here. My Smartstrip is still MIA within the UPS tracking system, although it did make a brief appearance in Hodgkins, IL before vanishing again. Funny thing is, they still show the status as "Scheduled Delivery: 7/21 (On Time)." My ArcadeVGA card has been shipped as well, but Airborne Express doesn't have any tracking information on it yet. I've gotten very fast deliveries from Andy at Ultimarc in the past, however, so I'm confident it will show up this week. Seems that there were a couple of bugs in the 0.953b release, including an installer glitch for Win98 users (which is the OS I use on the MAMEframe). Steve has gone above and beyond, however, and has quickly cranked out version 0.954b, which should be available on the MAMEWAH site shortly. MAMEWAH 0.953b has just been released! MAMEWAH is a great MAME frontend that runs under Windows (but looks nothing like Windows, a real plus! :-) It's my front-end of choice, and it just keeps getting better and better. The new version has a lot of bug fixes and some cool new features as well — one of the nicest improvements (aside from the child lock feature! ;-) is the customizable layout editor (I'll have to wait for the new README file before I can list all the improvements, but trust me, I'm sure it's great.) Thanks, Steve! According to UPS, my new Bits Limited SmartStrip should be delivered tomorrow (I don't always trust the UPS tracking system, but there's still hope!). I'm planning on giving it a full review, updating the current "mini-review" on the site. Look for it in a day or two. Kelsey of Oscar Controls just announced a new reproduction Tempest spinner assembly, and it looks great! He's always coming up with accurate and great-looking reproductions of arcade controls, and this looks to be no exception to the rule. Sorry for the late posting today, but I've caught what appears to be a 24 hr. stomach bug. Not fun. I'll post more news once I'm back up and around. I've decided to delay my review of the Wells-Gardner D9200 arcade monitor until I receive my Ultimarc ArcadeVGA card, which I ordered today. As the D9200 and the ArcadeVGA really complement each other, I thought it would be best to wait until I have both in my possession before reviewing either one. In the meantime, I did put up a brief 45-second "Sneak Preview" of the D9200 on the Video Reviews page. Well, it looks like the SlikStik arcade cab is now available for purchase on the SlikStik web site. They've got two versions, a "complete" version with all sorts of nice things added (Happs monitor bezel, coin door, speaker grills, etc.) and a "lite" version that is basically just the cabinet. Both versions include the pop-out keyboard tray, however. The testing of the Wells-Gardner D9200 continues. I'm using a great little freeware program called Nokia NTEST, which really allows you to thoroughly check out a monitor's specs. I've included it in the Files Section for downloading. Let The Play Testing Begin! Now that I've unpacked it, I've setup a temporary "test lab" in my workshop for the Wells-Gardner D9200 arcade monitor. Now comes the hard (fun) part, where I sweat (play) over the monitor to see how well it performs with MAME. Update: I've started some preliminary tests, and I'm already running into some "issues" with the monitor. Nothing earth-shattering, at least yet, but I've got some convergence and color purity issues with the D9200 that I'm trying to figure out how to work around. I suspect part of the blame may be the video card I'm using, so I'm going to swap out the GF2MX video card for the only other card I have "sitting around", a GF3 Ti200. Since they're both nVidia cards, I don't expect a huge image quality difference, but it's worth a shot. Update 2: Success! I've fixed the blemish (literally) on this otherwise fine monitor. Full details over on the MAMEframe II Construction Diary. <STEVE MARTIN>The New Phone Books are Here! Actually, it's even better than that — the Wells-Gardner D9200 arcade monitor arrived! 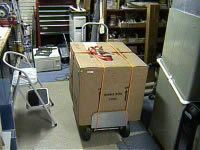 I just finished lugging it around the house and into the basement, no small feat considering the thing weighs nearly 100 pounds! I got some special "sneak peek" photos of the new SlikStik DIY cabinet yesterday — it's really looking impressive, especially the "hideaway" keyboard drawer. It looks like they're stating on their site that the cabinet will be ready in two weeks or so. No final pricing yet. I'll try and post new pics as soon as I get permission from SlikStik. Just got an email confirmation on my Wells-Gardner D9200 order — it looks like it should be here tomorrow or Thursday at the latest. Give me the weekend to give it a thorough testing, and I'll have the video review up first thing next week. I got my Oscar Controls Tempest Reproduction Knob in the mail yesterday afternoon, and I've got to say I really like it. I've only had it a day and already it's my favorite spinner knob. I have to laugh, unfortunately, since Christian Stango of SlikStik just recently told me that "whatever knob you get, that immediately becomes your favorite!" I guess he's right! Oops — sorry for not updating the news today until this afternoon, but I spent the morning writing my review of the SlikStik Stainless Steel Joystick Handles, which is now up and ready. Update: Finally! After two days of futile attempts to upload a single 5-meg file, I have successfully uploaded the video review of the SlikStik Stainless Steel Joystick Handles. Of course the fact that I had to sign up for a pay-per-use dial-up ISP doesn't make me feel warm-and-fuzzy about my current broadband provider, but at least the video is finally up. (You never really realize how addicted you are to broadband until it's taken away from you!) I only got 2.3 Kbps uploading, but at least it didn't disconnect every five minutes! Good news, bad news time: First, the good news — I've finished the video review for the new SlikStik stainless steel joystick handles. A surprise in my email this morning: an updated "universal vertical bezel" from Marcus Tiller! 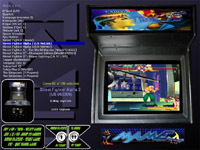 This bezel “fills in” the black bands on the sides of the screen with the MAME logo when you are playing a vertically-oriented game in MAME. You can even edit the bezel to put in your own artwork. The bezel files have been updated for MAME .71 — check it out in the Files section, and thanks, Marcus! Another delivery surprise today — the SlikStik Stainless Steel Joystick Handles (say that 5 times fast) have arrived! I'll be installing and videotaping them in action this afternoon, most likely. Give me a day or two to write the review and edit the video — I'll post a notice once they're finished. I'm also expecting one of the nifty new Tempest Reproduction Knobs from Oscar Controls soon. I'll be sure and post some pics and my impressions of it once it arrives. Big Item #1: The Retroblast Domain is now up and running! www.retroblast.com is now officially open for business. 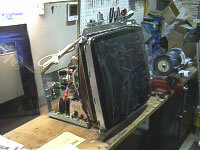 Big Item #2: I just ordered the Wells-Gardner D9200 27" Arcade Monitor for the MAMEframe II. I have no idea how long shipping usually takes for such a monster, but hopefully I'll have it within a week. Expect a full review of it shortly thereafter. RetroBlast Goes Live! The domain name won't be active until tomorrow evening at the earliest, but if you're reading this on the 9th, welcome to the special sneak preview!